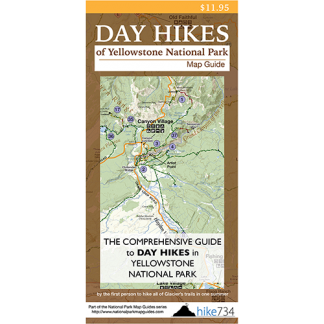 This beautiful and level hike is just as much about the hike along the Bechler and Falls rivers as it is about Bechler Falls. The hike begins at the wide and amazing Cave Falls as the Falls River pours over a shelf. From here, the trail follows the treed shoreline up the river. This gorgeous walk takes you past cascade after cascade. 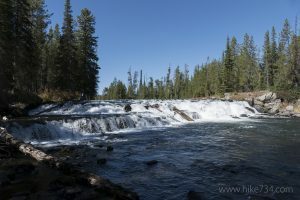 It leads to the confluence of the Bechler River into the Falls River. The trail continues along the Bechler River. The trail veers away from the river’s edge, however, you still get ample views of the cascading river. The trail gently climbs through the forest. From the trees, you get a sneak peek at the big cascade that is Bechler Falls. The trail eventually brings you to the edge of the falls. After enjoying the falls turn around here. You can turn this into a 7.5mi/12km loop that includes the Bechler Ranger Station. Continue upstream to the Bechler River Cutoff Trail. Take this level, wooded trail to the ranger station, then follow the South Boundary Trail through more lodgepole forest to the trailhead. Trailhead: Take the Cave Falls Road from Ashton, ID to the parking lot at the end of the road. The trailhead is at the northeast corner of the parking lot.